Kewpie makes food that seeks to combine great taste with good health. Our strengths lie in creating original and ingenious foods, a passion that we pursue with devotion, and that dedication has helped our business to grow. 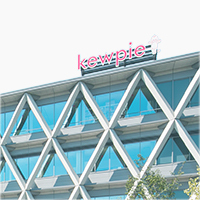 View Kewpie Group products manufactured and sold around the world. We rise to meet the trust placed in us by our customers, producing safe and reliable products and focusing on quality in all of our actions. True to our founder’s spirit of “contributing to society through food,” Kewpie’s activities go beyond the business sphere to help communities and the global environment. We conduct research so that our customers the world over can enjoy healthy diets in the future.